Beach Vacation? Rent a Timeshare! Does Orlando Make You Smile? Does Your Favorite Hotel Also Offer Timeshares? Las Vegas makes a great year round travel destination as one of the most exciting and entertaining cities in the world. Filled with amenities that only a complete resort destination can offer, Las Vegas is incomparable to any other city you may choose to visit. You’ll find: luxurious casinos, grand hotels, fine dining, wonderful live entertainment, and even attractions to delight the kids. Las Vegas is a city that has something for everyone. The most famous attraction is the Strip, recognized all over the world. Down this very long road you will find innumerable casinos, restaurants and sights to see. You can get a glimpse of amazing world famous re-creations like erupting volcanoes, the Eiffel Tower and the Sphinx of Egypt or enjoy the waters dance to music in front of the Bellagio. The Fremont Street Experience is a dazzling light show not to be missed. It spans an entire street with beautiful light images overhead. When you’re not in the casinos, visit shopping and museums by day, and the nightlife will keep you energized with top quality entertainment, concerts and headliner shows. Visit The Lied Discovery Museum for a fun place for the kids to make scientific discoveries and play. At the Las Vegas Springs Preserve the family can stroll through desert trails, indoor interactive exhibits and gardens. The Adventuredome Theme Park is 5 acres of indoor fun at Circus Circus. Kids will be thrilled with the rollercoaster, water ride and tons of carnival games. The Mandalay Bay also features the Shark Reef Aquarium with a touch tank to pet your underwater friends. There’s plenty of outdoor recreation in the Wild West of Las Vegas. View Picturesque and enchanting panoramas in the Red Rock National Conservation area. Lake Mead National Recreation Area caters to boaters, swimmers, sunbathers, and fishermen. Mount Charleston is great for hiking, wildlife photographers, and sightseers. For a grand adventure, take a helicopter tour of the Grand Canyon, Hoover Dam, and the Las Vegas Strip. Las Vegas is improving and building new attractions all the time, so, you will never run out of fun things to do. Even if you’ve been there before, you can always find something new to see in Las Vegas. See Las Vegas Timeshares available for rent. Plan your next vacation at a timeshare resort near a water park for hours of family fun! There are many timeshares on or near a water park and many offer the use of the park to guests for free, or provide a discount on entry fees. Each resort and park is different, so, check with yours before you go. Water parks are a great way to entertain the whole family with: giant slides, wave pools, spray jets, kiddie pools, “surfing”, tube rapids, waterfalls and more! All water parks offer different amenities. See their Web sites for more details. 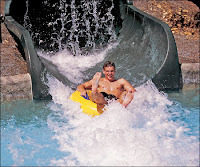 Have a wet and wild vacation in Vermont at the Smugglers’ Notch Water Park and experience the 8 pools and 4 waterslides available. With such attractions as Rum Runners' Hideaway and the Aqua Jump, this water park has more wet playgrounds than any other resort in New England. For accommodations, see Smugglers' Notch Timeshares for rent. With both an indoor and outdoor water park, you’ll never tire of the fun, wet, things to do at Massanutten Water Park in Virginia. The indoor portion is open year-round and is always 84 degrees Fahrenheit. Enjoy the Avalanche and Skyline Falls body slides, which start at 39 feet up! Feel the rush that keeps you coming back for more with over 250 feet of heart-pumping thrills with sudden drops and sharp turns. The outdoor portion features the Rockingham Racer. You’ll get your competitive juices flowing as you race side by side on this four lane headfirst downhill slide. For accommodations, see Massanutten Timeshares for rent. For 12 acres of tropical adventure, dive into Branson, Missouri's White Water park for the largest selection of water rides and attractions in the Ozarks. This outdoor water park offers water-blasters, super-soakers, speed water slides, and a wave pool. Featuring Kalani Towers, a 6-lane freefall and racing thrill slide, you can choose between two 75-foot freefall drop lanes or four mat racing lanes over 310-feet long. For accommodations, see Branson Timeshares for rent. Ah, what could be better than a beach vacation? Why a beach vacation in a timeshare rental! You don’t have to own a timeshare to enjoy all the benefits of staying in one. Most people probably don’t even realize timeshare rentals are a possibility for vacation travel and those who know find it the best kept secret. They are very happy travelers because they found resort accommodations at probably half the price others paid for the same resort on a travel Web site AND they are enjoying all the comforts of home. Timeshare resorts offer in-unit kitchens, (which also saves you money by reducing the need to eat out for every meal) and timeshare units also offer more space to stretch out than a small hotel room (with living room and dining room areas that feel just like home). This is a great vacation spot if you are looking for glamour, glitz, fine beaches, and plenty to do like diving or casino gambling. There’s so much to love about Hawaii and Waikiki is the most popular beach on the island of Oahu. It is truly a tropical paradise where you can take a surfing lesson, or just bask in the sun. If the combination of an active event-packed AND relaxing vacation at the beach is what you are looking for, you’ll be happy with your stay in Daytona Beach. It’s the beach that never sleeps. Or, browse all Beach Timeshare Vacations for more great location ideas for your next beach vacation. Don’t forget the sunscreen. Breakfast with Mickey at a Walt Disney World® character breakfast. Ride the Journey to Atlantis at SeaWorld® for a thrilling water coaster ride filled with twists, turns and watery falls. Dinner for two at Hemingway's, an award-winning, Key West-style, steak and seafood restaurant perched atop the half-acre swimming pool at the Hyatt Regency Grand Cypress. Shopping at one of the many malls available, like The Florida Mall, featuring 1.9 million square feet of shopping and over 250 specialty stores. Relaxing at a day spa such as the Mandara Spa at the Walt Disney World Dolphin Hotel. Dancing. Unwind to your favorite song at upscale lounge Blue Martini. Lose yourself on the green with 18 holes at Eagle Creek Golf Club. Get cultured at the Orlando Ballet. Get animated at Universal Studios on a wild ride with Homer, Marge, Bart, Lisa and Maggie Simpson. Reconnect after a long day of activities and enjoy a family meal prepared in the comfort and convenience of your spacious Orlando timeshare rental. The world always looks brighter from behind a smile and Orlando is a great travel destination year round. Remember what Mark Twain said, "wrinkles should merely indicate where smiles have been.” So, plan that vacation and get to smiling! It’s family vacation time and you know where your kids want to go? A theme park of course! There are so many great theme parks to visit with rides and thrills galore. In addition to rollercoaster’s, you can visit your favorite character, tour movie sets or watch aquatic animals in their natural habitats. There’s even music, dancing and parades to enjoy at a theme park, so, which one will your family visit this year? Live the magic at two enchanting Theme Parks — Disneyland® Park and Disney's California Adventure® Park. Located in Anaheim, California, you’ll fill your days and nights with the wonder and excitement. At Disneyland, known as “The Happiest Place on Earth,” you’ll find great rides for all ages like Finding Nemo and It’s a Small World for the younger kids and rocking rollercoaster’s like Space Mountain and Matterhorn for those who want a little speed. Parades and shows are happening throughout the park all day and there’s also great fun and shopping at Downtown Disney. At California Adventure, you’ll find the California that Walt Disney himself loved with his celebration of the state’s natural wonders, like the Soarin’ Over California ride which takes you on a simulated hang glider tour of the Golden State. Or, experience a typical state fair atmosphere with carnival games and Ferris wheels. Also, remember that Disney parks are free on your birthday in 2009. Find Anaheim Timeshare Resorts for rent. The theme parks at Walt Disney World are so plentiful, you’ll be glad you decided to stay a week (or even two) in Orlando, Florida! In addition to the famous Magic Kingdom® of the Walt Disney World theme park where you can enjoy classic attractions, your favorite characters, parades and fireworks, you wont want to miss the other theme parks close by as well. At Epcot® you’ll experience the culture and cuisine of 11 nations and discover how the future is now a reality by learning about technological innovation. Disney’s Animal Kingdom® is the world's largest animal-themed park where great adventures abound. Disney’s Hollywood Studios offer a behind-the-scenes glimpse of Hollywood-style action. And, water fun awaits you at Disney’s Typhoon Lagoon and Blizzard Beach where you’ll find water slides, waves and raft rides. Find Orlando Timeshare Resorts for rent. With parks in San Diego, California, San Antonio, Texas and Orlando, Florida, Sea World is a great day of fun where you can enjoy rides, shows and interact with your favorite sea animals. Watch Shamu the killer whale in the “Believe” experience, feed dolphins in the petting pool, or be amazed by acrobats who perform over the water in the Cirque de la Mer show. Ride and splash in the Journey to Atlantis ride, enjoy the view from the Skytower or let your little ones run free in Shamu’s Happy Harbor with rides just their size and the chance to meet Elmo and other Sesame Street friends. Find San Diego Timeshare Resorts for rent. Find San Antonio Timeshare Resorts for rent. Busch Gardens in Williamsburg, Virginia and Tampa, Florida, celebrates old and new traditions with charming European villages set against the backdrop of state-of-the-art coasters. Enjoy spectacular shows featuring like the Sunny Days Celebration with Sesame Street friends, Goin’ Country and the Festivale Italiano. Coaster enthusiasts can experience the finest and most thrilling coasters in the world, like the 205-foot Griffon that takes you 70 mph, and excites you with a 90-degree drop. Find Williamsburg Timeshare Resorts for rent. Find Tampa Timeshare Resorts for rent. This setup is particularly difficult for families with young children. You know how it is, once you put the kids to sleep, you have to go to sleep too because everyone is in one room. This is optimal for family travel because parents can put the kids to bed in one bedroom and continue to enjoy the rest of their evening in the additional living areas. Plus, think of the cost savings being able to prepare meals in the full kitchen in your room and not needing to eat out three times a day. In addition to the additional space, you will pay less for a timeshare rental than you would pay for the same room on a travel website. Timeshare owners can list their rentals online and offer them at any rate they wish, since they own the week. If you’ve never tried renting a timeshare before, you should compare prices. As you look at listings on a timeshare rental Web site, the number of bedrooms shown are almost always actual rooms off of the main living area. A studio or hotel-style accommodation would be listed as having zero bedrooms. Because they're typically equipped with sleeper sofas, a one-bedroom will usually sleep four people comfortably. Many timeshare resorts offer complimentary children's and family activities such as game night, movie night and even arts and crafts. Movie rentals are also an option with VCRs or DVD players in the units, so families can save money on entertainment as well. And, most have at least one (if not more) swimming pools at the resort and are often near: water parks, miniature golf courses, standard golf courses and theme parks to keep the family completely entertained. For your next family vacation, timeshare rental is truly is the best way to go. Its vacation time and you’re about to undertake your planning process in the usual way. Pick a destination. Find a hotel. Book airfare. Done. But, did you know that your favorite hotel chain may also have timeshare rooms available? And, what’s different about these rooms is the extra space and amenities you get, at a rate that is probably half of what you typically pay for a standard hotel room. Why is this? Hotel resorts created timeshare rooms and vacation clubs for timeshare owners who want to stay in home-like accommodations with family amenities. These rooms can be located right in the hotel, or at a separate resort right next to the hotel and are available for rent by the public from the timeshare owners themselves. In doing this, you’ll save a lot of money on your next vacation, which is a big plus, and on top of that you’ll have great comforts of home with extra space, kitchens and washer/dryers too. Marriott, a world-renowned hotelier, began offering timeshares in 1984 through their division called the Marriott Vacation Club International. They have developed exquisite timeshare properties in the most sought-after destinations around the world. The resorts are considerably large, providing guests with all the amenities of home - including one to three bedrooms, living and dining areas, master bedroom and bathroom, full kitchen, laundry facilities in the unit, and often private balconies. See all Marriott Timeshare Resorts. Hilton Hotels Corporation develops and operates timeshare resorts through the Hilton Grand Vacations Club. HGVClub offers their owners expanded exchange and travel benefits on a points-based system called ClubPoints. These points allow them to stay at a variety of participating Hilton HHonors hotels around the globe and enjoy other travel-related bonuses like discounts on cruises and airfare. See all Hilton Grand Vacations Club Timeshare Resorts. The Hyatt Hotel offers timeshare properties under the Hyatt Vacation Club. Their resorts are known for having high-quality amenities in their locations throughout the United States and Puerto Rico. The HVC gives their timeshare owners access to their collection of luxurious, boutique, timeshare resorts and hotel properties through a points-based program. See all Hyatt Vacation Club Timeshare Resorts. Wyndham Vacation Ownership, formerly Fairfield Resorts, is the world's largest vacation ownership business with a approximately 140 resorts to choose from throughout North America, the Caribbean and the South Pacific. You'll find Wyndham Vacation Resorts in America's most scenic and popular destinations. Every unit is fully furnished, and many feature special amenities such as washers and dryers, private whirlpool spas, fireplaces and VCRs. 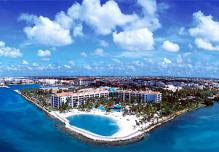 See all Wyndham Vacation Ownership Timeshare Resorts. Want to know if one of your favorite resorts offers timeshares? See this website for a directory of Timeshare Companies. Now that you know timeshare rentals are possible at your favorite resort, consider renting a timeshare for your next vacation. You’ll save money and love the home-like accommodations that are perfectly suited to family travel. As British Open week begins, golf fans start dreaming of new courses to play. Maybe you’ve never considered it, but, you can plan a golf vacation. Many resorts offer reductions in fees for golf courses they are associated with and if you're a golfer at heart, the combination of golfing, vacationing and saving money can be too good to resist. Here’s just a few places that offer great golfing on or nearby the resort. In addition to the possibility of savings on green fees, you’ll also save money on the room itself, because renting from a timeshare owner can be the cheapest way to enjoy luxury accommodations at an affordable price. See Golf Timeshare Vacations. Orlando, Florida contains about 40 outstanding public, semi-private and resort golf courses. Stay at the Marriott's Grande Vista resort and take advantage of the Faldo Golf Institute. This one-of-a-kind golf instructional experience was designed to help golfers of every level improve their skills and enjoyment of golf. This institute is located at the neighboring nine-hole "Faldo" course at the Grande Vista Golf Club. Seasoned golfers can test their skill at the 18-hole Grande Pines Golf Club, named one of "America's Best Resort Courses" by Golfweek, designed by renowned golf course architect Steve Smyers. Hawaii has 103 private and public golf courses to choose from. Play a round of golf at the the Kona Country Club and stay at the beautiful Kona Coast Resort I or Kona Coast Resort II, which offers a putting green to guests right on their property. Get ready for sunny skies and gentle ocean breezes at the Kona Country Club, located 6 miles away from downtown Kona on the Big Island of Hawaii. The golf course features spectacular ocean and mountain views, excellent facilities and friendly service. With over 90 gold courses scattered throughout San Diego, California, consider your next golf vacation here. Where else can you find such a perfect year-round temperate climate and almost no rain? 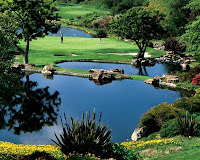 In the city of Carlsbad, on a hilltop amidst rolling valleys and a protected wildlife sanctuary, the Four Seasons Residence Club Aviara offers magnificent views of the Pacific Ocean, Batiquitos Lagoon, and Arnold Palmers championship golf course, The Aviara Golf Club (see photo above). Honored in 2008 as Condé Nast Traveler's number one golf resort in Southern California, Four Seasons Resort Aviara Golf Club course is sculpted around natural topography of the lagoon and offers guests superb facilities. If you’re on a budget this year, you’re not alone. The good news is that you don’t have to cancel your vacation plans due to reduced funds. With some prior planning, creative thinking and these tips from NECN.com reporter Louise Sacco, you can still have a great vacation. Take some kind of vacation, even a stay-at-home one. A break from your usual routine will refresh your physical and mental health. If you decide to vacation away from home, think about a location that is “off season”, like mountains in summer, or beaches in the spring or fall because everything will cost less and the location will be less crowded. Play tourist in your own town. You probably have a number of local attractions you’ve never visited, or, there are new ones just a few hours’ drive away. You don’t have to take an airplane to be on vacation and you can find an alternate place to stay in your own town as well. (see “where to stay” below) . Friends: Stay with friends for a few nights and invite them to do the same with you. Rent a Timeshare: Owners often have weeks they can’t use. Look for them on Craiglist.com or Redweek.com (the largest online marketplace for renting, buying, and selling timeshares). Hostels: If you don't mind sharing a room, (or bathroom), these are quite a bargain. Discounts: Many membership associations offer discount programs: AAA, AARP. As you look at your alternatives for travel, consider the bus or train. Be sure to factor in the costs associated once you get to your destination, such as rental car or cab fares. If you are going to fly, do advanced research to get the best price and try a bidding website to make an offer 25% below the going rate. You may not get it, but if you did, what a savings! Stock up at the local grocery store. Pack your own cooler with drinks and snacks. Or, if there’s a good restaurant you want to try, go for lunch instead of dinner (which can be cheaper). Or at dinner time, order a soup or appetizer or split an entrée. Many museums offer free admission one day each week or month (do research ahead of time). Look for discounts for kids, students, or seniors (if this applies to you or someone in your group). The main thing is to plan ahead. Do all your research in advance to find and compare the best rates and surface the right coupons. Great deals are out there, you just have to look. Does your pet travel with you? Accommodations can be the trickiest part of pet travel, but the good news is that there are many timeshare resorts that allow pets. See this list for pet friendly timeshare rentals to help you plan your next vacation around your furry friend. When pets are allowed, size restrictions typically apply. Be sure to contact the resort directly to be sure the pet friendly location you choose will accommodate your pets size (smaller is better). They may conduct a short interview with you about your pet and provide you with more details about their pet policies. You may also be required to sign a pet liability release form. The best resort are those that really cater to the four-legged visitor, offering treats, meals, bowls, sitters, and even beds. Never leave your pet alone in the room. If this is allowed, be sure to provide an assortment of toys and turn on the television or radio on low to give her a sense of companionship. Bring your own bedding along, or a portable carrier for your pet to sleep in. Do not allow your pet to sit or sleep on the furniture or beds in the room. When feeding and leaving water out for your pet, use the bathroom area or a tiled or hardwood floor. Timeshare resorts also typically have kitchens, which would be an ideal spot. Take your dogs for a walk off the property and always clean up and dispose of waste properly. Due to health regulations, pets are not allowed in areas where food is prepared or served, so, don’t be surprised when you can’t bring your pet to breakfast. Always keep your pet on a leash when outside the room. Dogs spook easily in new environments and for the comfort of others, a leashed pet is not as threatening. Being prepared and knowing what to expect should make traveling with your pet a great experience. When planning a family vacation, there’s a lot you can do in advance to prepare for the comfort and enjoyment of you children before you set off. The American Society of Travel Agents (ASTA) has provided this great list to help you think of all the little details you’ll need to make sure your next family vacation is fun and runs as smooth as possible. Then, all you need to do is just relax, enjoy and make great memories. Don’t forget the camera! Get the kids excited and involved. A “Days Left Until Vacation” chart or calendar with a photo of your destination is a great start. You can even go online and learn more about your location to tell them what you plan to see when you arrive and get them involved by asking what activities and attractions they might like to visit. Let them decide what to pack in their suitcase (of course you’ll have the final OK to make sure they’ve got enough shirts and the right kind of clothing (long sleeves in winter, shorts in summer). And let them choose a special toy to come along. Don’t forget to immunize the entire family if traveling abroad. Allow for extra time at the airport. Give yourself as much time as possible to allow for check-in getting to gates for connecting flights. Create a “safety plan” of where to meet and what to do in case someone gets separated from the group (ie. Find a uniformed airport employee and ask them for help). Make sure your kids know what to expect at the airport regarding baggage screening procedures and security checkpoints so they are not confused or frightened during the process. To save time, make sure to remove young children from their strollers or infant carriers before reaching the checkpoint, and fold the equipment so it may be easily passed through the x-ray machines. The Federal Aviation Administration recommends that children weighing less than 40 pounds be placed in child/infant seats. Before you go, make sure your seat meets current safety standards and is not more than 16 inches wide. If your flight allows, get seating assignment in advance to make sure you are sitting together. If this is not an option and the flight is full, ask the airline personnel if other passengers can change seats so your children are not seated apart from you. If you’re going on a road trip, you want to bring pillows and blankets for maximum comfort. Be sure to use the rest stops frequently for bathroom breaks, stretching your legs and running the kids around. Play games in the car (ie. I Spy, or License Plate game for group involvement) and bring along toys (such as Doodle Pads and Electronic games) for self entertainment. Playing their favorite music will help the time pass quickly for them as well. Keep fun trinkets along the way: brochures, napkins, ticket stubs - and create a scrapbook when you get home, or bring some glue and a notebook and keep a live diary. If you are renting a car, confirm ahead of time that they offer car seats with proper installation, or, bring your own. Don’t forget the stroller for younger children. Once you arrive at your destination, don’t over pack the day with activities. Plan for some down time. Bring your own outlet protectors for the room and check balconies and bathrooms upon arrival for any potential dangers (even if staying with family). Familiarize yourself with the fire and emergency evacuation routes and procedures. Whether flying or driving, have a tote / carry-on bag packed with snacks, hand wipes, tissues, books, gum, paper, and markers or crayons (in a sealed plastic bag to avoid the mess). You could even buy a special toy to surprise each child along the journey. And, if you need a great solution for quality accommodations that are ideal for a family vacation, look into renting a timeshare. Timeshares come equipped with kitchens, so, instead of eating out at each meal, which can be costly, you can prepare meals in your unit, with just a visit to the local grocery store to get you stocked up on your family’s favorite foods. Plus, with the extra room a timeshare provides, kids and parents can have separate bedrooms, providing privacy for adults when the kids go to bed early and privacy from adults for your older children (those teens need their space too). There are typically in unit laundry facilities, and separate bathrooms, not to mention entertainment amenities designed for kids and families, and all at a price that’s less than what you’d pay on a travel web site for a smaller hotel room. You’ll find timeshare resorts near the best themed kids attractions in the top cities across the country. Rent or buy a timeshare and see what you vacation’s been missing. Planning a vacation is fun and exciting and renting or buying a timeshare resale from an owner should be a great experience. But, some scam artists are out there to take advantage of those who are unaware of their tricks. If you plan to buy or rent a timeshare, beware of the “419 Overpayment Scam”. How it typically works is that the alleged renter or buyer sends you a cashier's check for more than the amount you agreed upon and in turn asks you to wire back the difference. Do not accept or cash a check that is not the agreed upon amount. There is no reason for them to send you more money than was discussed. A cashier’s check like this will most likely be counterfeit and your bank will hold you responsible for the entire amount. Be skeptical if you are asked to wire money to overseas, or if someone wants you to cash money orders or checks for them. Never give out personal or financial information to anyone you don't know. Familiarize yourself with money order services offered by the post office. Never accept money orders, cashier’s checks or personal checks for more than the asking price. Never agree to wire funds to a buyer. Never wire funds to anyone unless you're sure the money order or check you’ve deposited has cleared your bank and the funds have been released. An escrow service is the safest way to conduct financial transactions. First American Title offers a special escrow process for renting and selling timeshares. If you are a United States citizen and believe you have been a victim of this type of fraud, please contact your local Secret Service field office. For those in other countries, the 419 Coalition Website has reporting instructions to how to file fraud claims. If you are planning your vacation, you won’t want to miss staying at the magnificent Hacienda del Mar Resort in Cabo San Lucas, Mexico. Located in the mystical desert landscape of the Baja Peninsula, Cabo San Lucas offers endless scenic vistas to dazzle the eyes and you’ll find many spots to capture that perfect vacation photo. This travel destination is great for family vacations. You can go parasailing, swim, surf, build a sand castle, or just relax with some sunbathing. The sports enthusiasts and "extreme" vacationers will enjoy scuba diving, snorkeling, rock climbing and Cabo’s famous marlin sport fishing. Plus, there are numerous world class golf courses for players at any level. The grounds of the Hacienda del Mar Resort are meticulously maintained and the infinity pools are spectacular making it one of the top places to stay in Cabo San Lucas. The resort is decorated in traditional Mexican furnishings with tile floors. The master bedroom boasts a jacuzzi tub and each room has a balcony which is great for watching the sunsets. The staff is wonderful and the rooms kept very clean. You’ll even find a pool concierge to attend to your every need poolside, like cleaning your sunglasses or fetching a towel. The restaurants are top notch with delicious choices and you also have the opportunity to cook in your room with full kitchens, (grocery stores and a Costco are close by just a short drive away). You’ll find pristine beaches, great for swimming and the environment at the resort is very kid friendly. Don’t forget the fun at happy hour! This resort will make your Mexico vacation dreams come true. See other Cabo San Lucas timeshares. Were you one of the first to see President Barack Obama at Walt Disney World? His likeness, nicknamed “Roboama”, was built at Los Angeles warehouse under a veil of secrecy, and was recently installed into the Hall of Presidents just in time for a July 4th unveiling. Along with the addition of the new president, the entire Hall of Presidents experience was redone, including new robotics, video segments and George Washington speaking for the first time. Located in Liberty Square inside the Magic Kingdom theme park, The Hall of Presidents is an inspirational tribute bringing you up close and personal to every American president in a 23-minute stage show. With true Disney theatrical magic, you’ll first view a film that illuminates the origins of the United States, with the formation of the Constitution and the hard-fought struggles of the Civil War. Then the curtain rises on stage as each president says a few words ending with stirring patriotic speech delivered by President Abraham Lincoln. Come to Disney World and see the classic attraction, envisioned by Walt Disney himself. And, if you are looking for accommodations while you are in Florida, check out these Disney timeshare rentals for great rates and more space than a traditional hotel room. Great for family travel. From the Forbes Travel List, below are the top 3 most visited cities out of the 30 reviewed on their America’s Most Visited Cities report. Dan Erkkila, former Chairman of the Board of the Travel and Tourism Research Association, says “More and more, the marketing of destinations is about how a destination will make you ‘feel’ when you visit. It is about the whole experience. It’s about how it changes you—momentarily or forever.” Take a look at the top 3 cities and add your comment below telling us how each destination makes you feel. Las Vegas was the #1 most visited city, reported by Forbes Traveler. There’s always something to do in Vegas: Shows, events, music (you can get tickets to see Beyonce July 30 - Aug 2), sports, spas, golf (at Eagle Crest or Callaway to name a few), shopping (like the Forum Shops at Caesars), dining, attractions, nightlife, wedding chapels and of course casinos, casinos, casinos! See Las Vegas timeshare rentals. The 2nd most visited city was Los Angeles. Hollywood movie stars, high-profile sports teams, fun attractions, beautiful Pacific beaches and theme parks (like Disneyland in Anaheim and Universal Studio a short drive away) are just some of the reasons tens of millions of vacationers come to Southern California. Anaheim is just 25 miles away from downtown Los Angeles. See Anaheim timeshare rentals. And, coming in at 3rd place was Orlando. With readers rating that their reason to visit Orlando was mostly for such top tourist attractions like Disney World, Sea World and Universal Studios (just outside Orlando), the city also has a lot to offer with shopping, restaurants and must-see attractions like those on International Drive and in Pointe Orlando. Local DJ and music scenes make up an exciting nightlife where visitors can hang out in cool lounges to dance until the wee hours or relax in a laid-back pub. See Orlando timeshare rentals. See the complete list and slideshow with 30 of America’s Most Visited Cities at ForbesTraveler.com. Hawaiian paradise awaits Hilton Grand Vacation Club timeshare owners with seven top resorts to choose from in beautiful Oahu and the Big Island of Hawaii. The Hilton Grand Vacation Club timeshare properties in Oahu include: Hilton Hawaiian Village and its two towers, The Kalia Tower and The Lagoon Tower; and their newest resort The Grand Waikikian. On the Big Island you’ll find: The Waikoloa Beach Resort, The Bay Club at Waikoloa Beach Resort and Kings' Land. And, if you are not a current owner, you can rent a Hawaii timeshare from an owner and get all the amenities and luxuries for yourself. Set against a backdrop of stunning natural wonders, Hilton Hawaiian Village Beach Resort & Spa provides visitors with spectacular amenities in the heart of paradise. The exotic playground at Lagoon Tower combines tropical plants and flowers, shimmering swimming pools and sparkling waterfalls to deliver an unmatched vacation experience. Tropical treasures abound for guests at the Kalia Tower with panoramic mountain or ocean views. The exquisite Grand Waikikian is HGVC’s newest resort which overlooks Hilton Hawaiian Village. With spectacular views, first class service, and all the comforts and conveniences of a luxury condominium, this 38-story tower heralds a new era of elegance. Superbly positioned on the sunny Kohala Coast of Hawaii’s Big Island, the Waikoloa Beach Resort will provide a relaxing haven for your next vacation with tastefully decorated furnishings in a casually elegant tropical style. Nestled between two championship golf courses, lava fields, and ancient Hawaiian petroglyphs the Bay Club at Waikoloa Beach Resort features expansive views and luxurious accommodations. Carved out of an ancient lava field, the 112-acre oasis at Kings’ Land offers expansive fairway views and stunning panoramas located between two of Hawaii’s finest golf courses, the Kings Course and the Beach Course. It’s not too late to enter the “Bring Your Vacation to Life” contest sponsored by VacationBetter.org. You have until August 31, 2009 to submit your timeshare vacation memories for a chance to win a $1,000 AMEX gift certificate. VacationBetter.org, brought to you by The American Resort Development Association (ARDA), is an online informational resource which reports on all the benefits of vacation ownership including timeshares, fractionals and private residence clubs. This July 4th holiday weekend would be the perfect time to capture your vacation memories with photos or a video (3 minutes or less) showing how a timeshare vacation memory has enhanced your life and family time, or how annually scheduled vacations have improved your health and quality of life. VacationBetter is launching this contest in an effort bring awareness to the fact that people who make a conscious effort to go on vacation and take time to reduce their stress and connect with family, gain important health benefits. As you document your vacation memories this summer, they want to know what a timeshare vacation really means to you and your family. A $1,000 AMEX gift certificate will be awarded to the winner of the contest, and their story (and video) will be displayed on the ARDA.org and VacationBetter.org web sites and also featured in ARDAs Developments magazine. The deadline for entries is not until August 31, 2009, so, if you have a trip scheduled at your timeshare resort this summer, remember to take the video camera with you and create a quick video of your adventure. Or, you can find photos from your last trip and create a video montage or photo collage page, along with a story, telling how the timeshare vacation improved your quality of life. Check out the VacationBetter Channel on YouTube for more details on how to enter the contest, or, just visit VacationBetter.org.